The Lifepak 9 from Physio-Control, a microprocessor-based unit, is available in models: 9, 9P (pacing), and 9A. These units have a built-in recorder and sealed lead acid battery back-up. Lifepak 9s meet current ACLS standards and allows for 17 energy selections, HR alarms, 5-lead monitoring, recorder and CODE SUMMARY critical event record. The Lifepak 9 is defibrillator/monitor, cardioscope, and non-invasive pacemaker. It provides 17 energy selections, heart rate alarms, three-lead ECG monitoring, recorder and Code Summary™ critical event recorder. 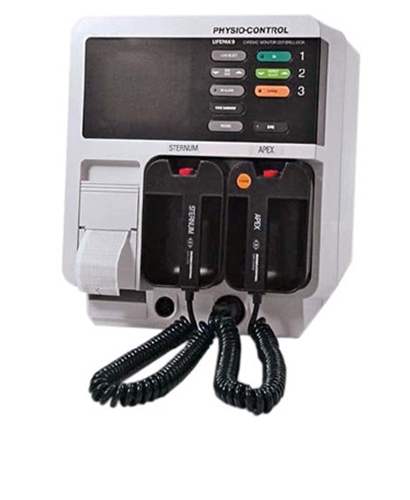 The microprocessor-based Lifepak 9 includes an internal battery supply and is available with optional pediatric paddles, internal paddles, pacing cable and pads, and ECG patient cable and leads. Isolated ECG via Quick-Look defibrillator paddles, Fast-Patch disposable defibrillation/ECG electrodes or three-lead patient cable.